This week, well, anyone would be understood for walking away from me. I felt as though I have called on so many confidantes and yet I know, my friendship circle is small. 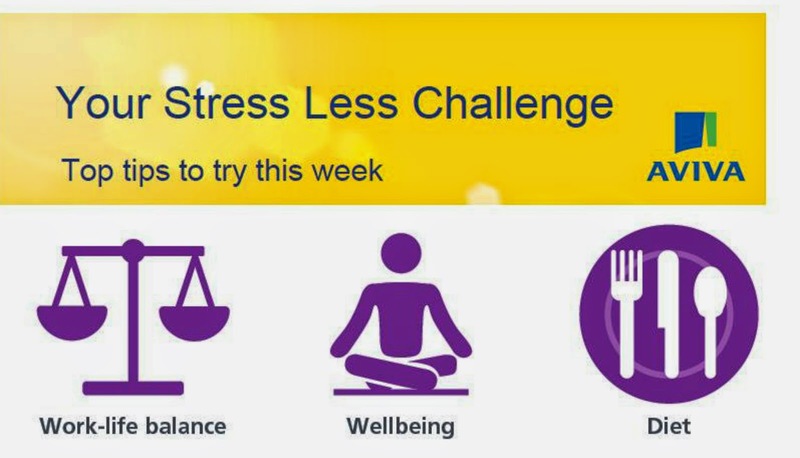 I committed to this challenge thinking I had a good grip on stress in my life. I was just struggling with tying things together. This week has proven that whilst you can live in a stressful life, and be accepting of it, how can you possibly cope when the unknown tips the balance? I enjoyed the first week of recommendations. I have used the breathing technique to help me, which was recommended by Dr Doug Wright, who has worked at Aviva for 15 years from full time practice as a GP. “This is a good relaxation technique and easy to do anywhere. Try deep breathing for one minute. Breathe in deeply through your nose and work your diaphragm muscles. Fill your lungs completely with oxygen, then exhale slowly through your mouth. This particularly helps to reduce anxiety and nerves”. This was a winner, it reminded me of techniques forgotten- namely relaxing on a beach with the waves relaxing the body. The beach helps me sleep. The technique recommended helps me deal with the stresses of the day, preempting events yet to happen. And so, I have welcomed my email containing more help from Ariva on how to support my life. The aim of this week is to find to adopt a recommendation which will last a lifetime. After reading my email, which provided advice from the aforementioned, Dr Doug Wright it also provide help from Paddy Anson, Head of Strength and Conditioning at Gloucester Rugby who’s tasked with setting out the training and diet plans for the players and fitness tips from England rugby players Billy Twelvetrees and Jonny May and former Captain Mike Tindall. And so obviously for me, with this much good advice was understanding which to would become my long term habit. There was one I definitely want to adopt, if working away and packing for a break had been no obstacle- and that is, getting out for a run (slow jog/ walk). I think this would make the world of difference. There are so many days I make the excuse that I can't get out for a class, but there is nothing to stop me putting on trainers and going for a jog (apart from my own fitness levels). And then there is the recommendation for 'our' time, that of husband and wife, Partners. The sad truth that I was so full of stress and worry on our 4th wedding anniversary that I could not cope with the idea of celebrating. Truth of it is a night out talking would probably have done me the world of good. How could I not want and need to adopt the recommendation of 'our time'? And then there is the recommendation of portion control. I know this to be a, literally, massive issue. From picking at the children's meals, to figuring it's easier to throw it all in, than to waste. I need to get a hold of snacking and portions, and no amount of exercise will offset these. And so, for my next week, I know I will take the recommendations for breathing and spending time with my husband- we are taking a week off. More importantly, I have to think about how, how much and what I eat. And try and build proportion. Disclosure: I am a member of the Mumsnet Blogging Network which offered 10 bloggers the opportunity to participate in this challenge. All views and opinions written are my own.